Well, Cinco de Mayo is just around the corner, so how about a nice Mexican recipe? 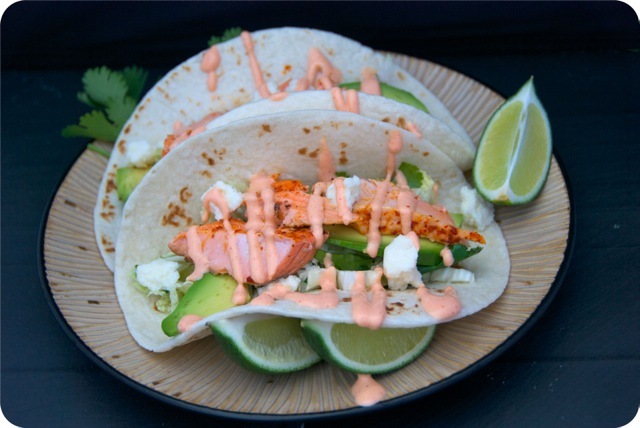 I’m not sure exactly how often Mexicans eat salmon, or Sriracha for that matter, but hey– tacos are tacos! And these particular tacos are amazing. This was actually my second time making these. The first time, I stuffed them in my pie hole so fast the camera didn’t even have a chance. I found this recipe on the blog Peas and Crayons, which I stumbled upon via Pinterest. It’s written by a Marine pilot’s wife, so it’s fun to follow. And she’s got tons of delicious looking recipes! Both times I made these tacos, I made them for guests. They’re great because they’re pretty quick and easy to make while entertaining. And everyone who tried them absolutely loved them! Preheat broiler. Rub salmon with chili oil. Place on a parchment-lined baking sheet, then sprinkle with seasoning. Broil 10 minutes, until just cooked through. Cool on the pan 5 minutes, then use a fork to flake into bite-sized chunks. Meanwhile, in a large bowl, whisk together vinegar, honey, lime juice and garlic powder. Add cabbage, green onions and cilantro to the bowl and toss to coat. Season with salt and pepper. Combine Sriracha Ranch ingredients in a small bowl. Mix well. 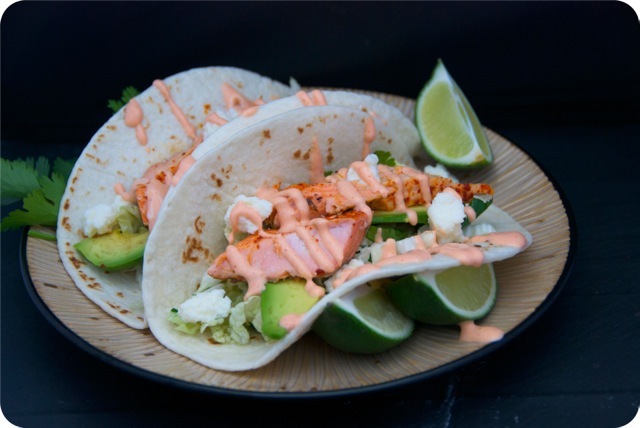 To assemble tacos, add salmon to a tortilla and top with slaw, avocado slices, cotija, Sriracha Ranch and a squeeze of lime. Enjoy! One of the things lacking in El Paso is fresh fish. I’ve been able to make do with what we’ve got, but it’s a shame. I found some vacuum-sealed blacken salmon at the grocery store that would be perfect for this recipe. Yum! Mmmm! I love fish tacos! That sriracha ranch sounds amazing! 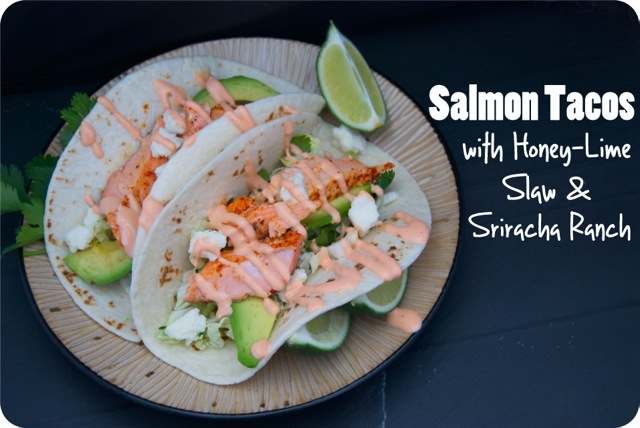 What a tasty twist on fish tacos! I have never used salmon as the filling but you make it look SO awesome! Thanks!! They are SOOO yummy!